I have previously blogged on A Patron – Client View of the Gospel as a key way to understand MBB journeys to faith in Christ, and, by implication, how we can share the gospel with Muslims. Based on some feedback I’ve received from the article, it seems extremely difficult for most Westerners to grasp the concept. 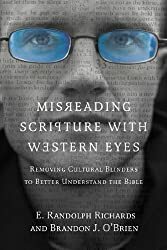 In that respect, I highly recommend Misreading Scripture with Western Eyes: Removing Cultural Blinders to Better Understand the Bible, which does a fantastic job of explaining culture and interpretation in an enjoyable and edifying way. Joining words together, though, can be far more significant than merely vocabulary. Some words have special meanings when they are paired with other words. In the New Testament, for example, the word charis means "grace." Pistis means "faith." What we didn't know until recently-what went without being said in Paul's day- was that those two words together described the relationship between a patron and his or her client. In the Roman world of the New Testament, business was conducted through an elaborate system of patrons and clients.' When we watch the movie The Godfather, we are seeing the modern remains of the ancient Roman patronage system. Like Marlon Brando who played the godfather in the movie, the ancient patron was a wealthy and powerful individual (male or female) who looked after his or her "friends" (clients). The complex world of Roman governmental bureaucracy, the far-reaching tentacles of the banking system (usually temples) and the pervasive and powerful grasp of the trade guilds made it impossible for ordinary craftspeople or farmers to conduct business on their own. They were entirely dependent upon their patrons. Like most unwritten cultural rules, everyone knew what was expected of a patron and a client, even though expectations weren't engraved on a wall. Everyone knew a patron's role was to solve problems for his or her clients, whether it was trouble with the local trade guilds, refinancing a loan or smoothing over tensions with city leaders. When Paul was staying in Thessalonica, it was reasonable to expect Jason to handle the "Paul problem," which he did by asking Paul to leave town (Acts 17). In that world, an ordinary craftsman or farmer didn't have the social skills or connections or wealth to negotiate with the various powerbrokers of a city. He would seek out an individual, a patron, to help. Marlon Brando captures the sentiment well. The local merchant wants help. The godfather says, "So you want me to do you this favor?" Both sides understand the agreement: the godfather solves the problem, and the merchant now must be loyal to the godfather and be ready to help if he is ever summoned. In the Roman system, likewise, the client couldn't earn the "favor"; the patron showed "kindness" to help. Seneca, a philosopher from Paul's time, said the patron and the client had a relationship, a form of friendship.6 The client was now a "friend" of the patron, but not a peer. The client was expected to reciprocate with loyalty, public praise, readiness to help the patron (as much as he could) and, most importantly, gratitude.' This kind gift had strings attached. (All gifts in antiquity had strings attached.) Seneca called it "a sacred bond."' The recipient of the gift was obligated to reciprocate. Paul introduced Lydia to Christianity (Acts 16). She reciprocated by hosting Paul and his team at her estate. The language of patronage permeated everyday life. We know well the Christian terms grace and faith, but these were common before Paul used them. They were part of the language of patronage. When the patron gave unmerited gifts of assistance, these were commonly called charis, meaning "grace/gift.."10 The client responded with faithfulness to the patron, called pistis, or "faith."" We see that when Paul explained our new relationship with God, he used something everyone understood: the ancient system of patronage.12 Taken together, this vocabulary-so central to the Christian faith-means something different than the sum of its parts.13 (Kindle Locations 847-866). Now Paul wasn't opposed to the patronage system; he probably couldn't imagine a world without it (Kindle Location 1802). Because it was impossible to escape the patronage system, Paul worked within it, even in his explanation of the Christian message of salvation. Patronage had its own vocabulary. Words we usually consider particularly Christian terms-grace and faith-were common parlance before Paul commandeered them. The undeserved gifts of assistance the patron offered were commonly called charis ("grace" and "gift").' The loyalty the client offered the patron in response was called pistis ("faith" and "faithfulness").9 Roman philosophers noted that when one received a god's favor (charis), one should respond with love, joy and hope.10 When Paul sought to explain the Christian's new relationship with God, then, one of the ways he did so was in terms of the ancient system of patronage - something everyone understood. In other words, it went without being said that relationship is the premier and determinative aspect of charis, grace (Kindle Locations 1808-1813). I believe that relationships today in Africa, the Middle East, and throughout Asia are largely defined by patronage, whereas in the liberal, democratic cultures of North America and Europe, relationships are defined by equality and freedom (except in politics). If this is even remotely close to reality, how can Westerners use the concept of patronage to share the gospel with Muslims? This is good material. The question then, to me, is when and how does Paul (or anyone else) utilize the concept of patronage to talk about salvation explicitly? One occasion that comes to my mind is the parable of the talents. How do I talk with Muslims?